This is the time of year when I spend endless hours walking the local hedgerows hoping to find roosting Long Eared Owls. On the 12th I was in for a surprise as I spotted not a Long Eared Owl but a Short Eared Owl staring at me from amongst the ground cover. It made no attempt to fly so I took some photos and realised it was very wet from the heavy rain of the previous night. I managed to catch it and was reminded how sharp its talons were! Upon examination there was nothing wrong with the bird except its flight feathers needed drying out. For this to happen I decided to place the Owl on a branch five feet off the ground. I set my camera up fifteen feet away and walked off for twenty minutes to see if its feathers would dry out. 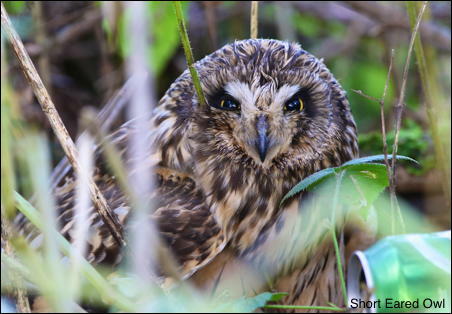 Unfortunately when a Short Eared Owl sees a human being it screws its eyes up as can be seen in this weeks gallery shots. I was hoping that if I came back later it would be more relaxed and produce a better photo. I checked through the binoculars some distance away and could see it had relaxed so I set off back to the camera. Just as I got there the Owl looked at me as if to say thank you and flew strongly away – you can’t win them all!! This is the first Short Eared Owl I have seen locally for 29 years. During the big influx of 1986 a dozen Short Eared Owls spent winter on Hopwood Golf Course and I had them all to myself! That would not happen today.